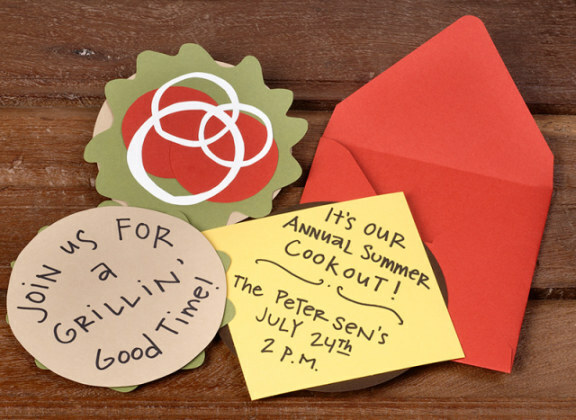 Looking for a summer party invitation that will WOW your guests? Send them a tasty hamburger with all the trimmings, including your party details! Such a fun and unique idea for cook outs and backyard bbqs. Our favorite part – it features one of our brand new colors…persimmon! 1. Prepare your ingredients as shown in the How to PDF. Cut out the burger bun and lettuce leaf from circle cards. Cut out cheese, tomatoes, and onions from cover weight paper. 2. Write your invitation welcome line on the top bun. Write your event info on the cheese slice. 3. Build your burger with double stick tape to adhere layers using PDF diagram. 4. Mail to party guests, yum! Please note, square envelopes require $.20 extra postage, but it’s worth it! So freakin’ cute! And I love seeing a new color in action. Think of all the ways you could modify the design, too, for your Vegetarian guests, for example! it’s a cheesie burger! so cute! Very cute idea! I’m tucking this away for future reference. Too cute!! Great idea, definitely going to make some of these invites. This is such a clever idea! Love it!!! Nom, nom, nom! I’m going to use this for a Father’s Day card – my Dad loves hamburgers! you could do a really cute version of these with a cupcake motif. that would be SOOO cute too! This is one of the best ideas I’ve seen on here. So palyful and easy! tina – you are “super” welcome! becky – no ingredients were harmed in the designing of this burger! robin – did i mention it’s low-cal too? marisa – tuck away…it’ll never go bad! ruby – glad you’re a burger lover! kathleen – thanx! the sound effects make it even yummier! liberty – very clever! wait for the club sandwich sequel! lisa – thanx! persimmon is my new red! heather – glad you’re enjoying this one! kylie – that’s using your noodle! dad + burger = happy father’s day!